A Salve for Chilblains, broken skins Take, 2 ounces of yellow bees-wax 2 ounces of fresh butter out of the chum. a quarter of an ounce of Sperma-ceti. Scrape the Beeswax very thin; and put all the [illegible] dients into a new pipkin over the fire; let 'em simmer but not boyl up, that the butter may not run to oyl: Take it off, & set it on again, and let it simmer 3 or 4 times till the whole is melted. Then pour it in a China- bason of cold water, and take it out, and roll it upon clean paper into balls. Shoes Balls Half a pound of Bees-wax. Four ounces of Ivory- black pounded. Half a pound of soft soup. Two Ounces of Sugar- Candy pounded very fine, A spoonfull of Oyl of Turpentine. Boyl them together, and then make into Balls. 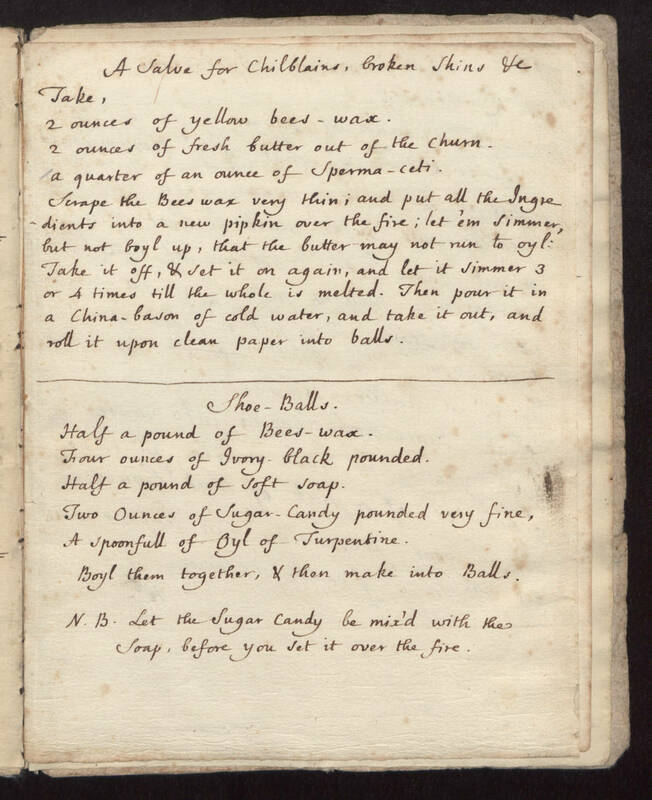 N.B Let the sugar candy be mix'd with the Soap, before you let it over the fire.